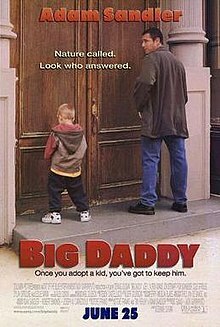 Big Daddy is a 1999 American comedy film directed by Dennis Dugan and starring Adam Sandler, Joey Lauren Adams and the Sprouse twins. The film was produced by Robert Simonds and released on June 25, 1999, by Columbia Pictures, where it opened #1 at the box office with a $41,536,370 first weekend. It was Sandler's last film before starting his production company, Happy Madison Productions, his first film distributed by Columbia Pictures, and his highest-grossing film domestically until Hotel Transylvania 2 (2015). Immature and lazy 32-year-old bachelor Sonny Koufax lives in New York City, and refuses to take on adult responsibility. Despite having a law degree, he refuses to take the bar exam, works one day a week as a toll booth attendant and lives off a large compensation payout from a minor accident. His girlfriend, Vanessa, threatens to break up with him unless he grows up. His roommate, Kevin Gerrity, proposes to his podiatrist girlfriend Corinne Maloney before he leaves for China to work at his law firm, and she accepts. Sonny constantly teases Corinne, especially about her former job at Hooters. The next day, Sonny wakes up to find a five-year-old boy named Julian McGrath abandoned at their apartment. A written explanation says that Julian's mother is no longer able to care for him and that Kevin is his biological father. Sonny assures Kevin that he will look after Julian until Kevin returns from China. In order to win Vanessa back, Sonny introduces her to Julian. However, he discovers that she is now dating Sid, an elderly man who is more motivated and intelligent and has a "five-year plan." Posing as Kevin, Sonny takes Julian to his social worker Arthur Brooks, telling him that Julian should return to his mother. However, Brooks informs Sonny that Julian's mother died of cancer. Sonny then decides to raise Julian his own way. As such, the boy renames himself "Frankenstein" and also helps Sonny find a new girlfriend in Corinne's lawyer sister Layla. Brooks finds a foster home for Julian and leaves messages for Sonny, but is suspicious when Sonny does not answer. At a meeting at Julian's school, the teacher is shocked by the terrible habits Sonny has allowed Julian to develop, causing Sonny to rethink his parenting methods. He turns himself and Julian around, but then Brooks arrives to find out Sonny impersonated Kevin and Julian is taken away. In court, numerous people including Corinne testify on Sonny's behalf and tell the judge he is a suitable father. Julian also testifies and provides information regarding his heritage. As a final straw, Sonny calls himself to the stand and asks his Florida lawyer father Lenny, who is present, to interrogate him. Despite Lenny's fervent belief that Sonny is not father material, Sonny convinces Lenny that he will try his best at being a father. Impressed by Sonny's sincerity, Lenny vouches for him. Nonetheless, the unconvinced judge orders Sonny's arrest. Kevin, having pieced the necessary information together, confesses to being Julian's biological father and insists they drop the charges. Sonny remains friends with Julian and hands him off to Kevin, watching them bond. One year later, Sonny has turned his life around: he is a successful lawyer, is married to Layla, and they have a child of their own. At Sonny's surprise birthday party at a Hooters restaurant attended by Kevin, Corinne, Julian and others; Sonny sees Vanessa working as a waitress, with Sid working as a cook, revealing his "five-year-plan" has gone awry. Everyone but Vanessa celebrates Sonny's birthday. On Rotten Tomatoes the film has an approval rating of 40% based on 93 reviews, and an average rating of 5.1/10. The site's critical consensus reads, "Adam Sandler acquits himself admirably, but his charm isn't enough to make up for Big Daddy's jarring shifts between crude humor and mawkish sentimentality." On Metacritic the film has a weighted average score of 41 out of 100, based on reviews from 26 critics, indicating "mixed or average reviews". Audiences surveyed by CinemaScore gave the film a grade B+. Nathan Rabin of The A.V. Club called it "Sandler's best movie" noting that "Sandler possesses an innocence that makes the mean-spiritedness inherent in much of his work surprisingly palatable." Robert Koehler of Variety magazine called it "a step forward for Adam Sandler, as well as a strategy to expand his audience. While the loyal male-teen aud[ience] core will not be disappointed with the spate of gags just for them, story contains solid date-movie material." Kenneth Turan of the Los Angeles Times said: "There's no doubt Sandler is talented, but if he persists in believing that, like Elvis, his presence alone covers a multitude of omissions and inconsistencies, he will squander his gift and make a series of forgettable films in the process." Roger Ebert of the Chicago Sun-Times describes the main character as "seriously disturbed", the story as "predictable" although he did praise Joey Lauren Adams. ^ a b c "Big Daddy (1999)". Box Office Mojo. Archived from the original on 21 February 2010. Retrieved 2010-03-13. ^ a b "Big Daddy reviews". Metacritic. CBS Interactive. Retrieved 2010-03-13. ^ "Adam Sandler Movie Box Office Results". www.boxofficemojo.com. Retrieved 2018-02-11. ^ "Big Daddy Movie Reviews". Rotten Tomatoes. Archived from the original on 22 March 2010. Retrieved 2010-03-13. ^ "Big Daddy - Original Soundtrack - Songs, Reviews, Credits - AllMusic". AllMusic. ^ "big daddy - soundtrack review". www.dowse.com. ^ "BMI Honors Top Film and TV Composers". 15 May 2000.